I have the hardest time getting the kids to do chores lately, but instead of giving up all together I have come up with a new solution, make it a game of course! We received this prize wheel from BryBelly the kids have been facinated with it ever since. wheel is filled with colorful sections and each one can be written on with a dry erase marker. I simply wrote down a different chore on each color and left one open for a “Free Day”. 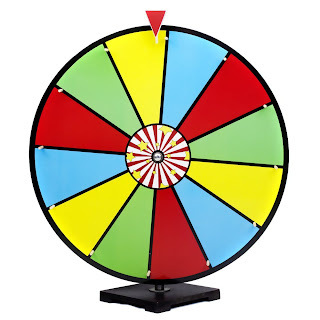 The boys love spinning it in hopes of getting the free day! Of course the odds are against them but the chores are easy so they just keep on trying! It’s so funny, but the end of the night my whole house is going to be cleaned!! I wonder when they’ll catch on? The BryBelly wheel is a metal stand on a wooden base with a wooden wheel. The bright colors get even the baby’s attention and it seems everyone enjoys just sitting there spinning it… Kind of weird right? Well momma’s gonna get her house cleaned!